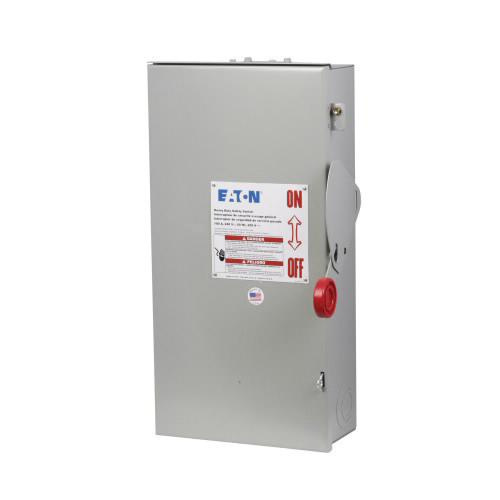 Eaton K Series 3-Pole 4-Wire Heavy-duty safety switch is rated at 100-Amps and 240-Volt AC. It has power rating of 7.5 hp at 240-Volt AC for 1-Phase, 15 hp at 240-Volt AC for 3-Phase, 15 hp at 240-Volt AC for 1-Phase, 30 hp at 240-Volt AC for 3-Phase and 20 hp at 250-Volt DC. Surface mountable switch features painted galvanized steel construction. Fusible switch with solid neutral, has mechanically interlocked cover that prevents internal device access during On position. It measures 12.75-Inch x 9-Inch x 22.5-Inch. This 3PST switch uses Class H cartridge fuse for providing protection to low-voltage electrical installation against short-circuit/overload current. It is perfect for heavy commercial and industrial applications where reliable performance and service continuity are critical. It has NEMA 3R rated outdoor enclosure for safety. Switch is UL listed. * Inventory displayed is accurate as of 04/19/2019 05:40 EDT.